You know how the Force works in Star Wars. There’s a light side and a dark side, and they spend most of their time giving each other serious stink eye across the galaxy while occasionally chopping bits off each other. Hands, mainly. Both sides really have a thing for hands. 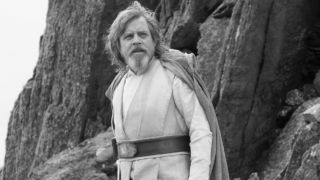 However, that wasn’t always the case and it might not be in the future either if a Star Wars: The Last Jedi fan theory about the ‘gray Jedi’ turn out to be true. It appears that since Disney restarted the franchise and took it away from George ‘taxation of trade routes’ Lucas, it’s been adding mentions to this concept of a 'gray Force' everywhere. The Star Wars Rebels series, Star Wars: Rogue One, and numerous supporting books have all gently reinforced the idea that the gray Force is a thing. The Force Awakens’ big bads, Supreme Leader Snoke and Kylo Ren, are clearly dark side Force users but they're not Sith. Kylo also says at one point: “I feel it again... the call from the light,” which is not something you expect from a pure dark sider. Plus, no one currently even knows what a ‘Knight of Ren’ actually is. Was Luke trying to train a new form of Jedi and failed to get the balance quite right? But let’s backtrack a moment here. This isn’t just Disney making stuff up for a surprise twist in the films. It does tie back into some of George Lucas’ very early ideas for Star Wars. When he was working up the first versions of the story it was originally going to be told by immortal creatures known as the Whills. The concept didn’t stick, but the idea of an overseeing universal presence became the Force. This is important because in Rogue One, Chirrut Îmwe is a Guardian of the Whills, at the temple in Jedha, reinstating the concept into film canon (the Whills were also mentioned in the prequels). Then there’s Bendu, a huge, armoured cow-like character from Star Wars Rebel’s second and third seasons. He’s an ancient Force user who describes himself as ‘in the middle’ of light and dark, awoken by an imbalance. Again, this is Disney working in old elements of Lucas’ ideas, like one early name for the Jedi, the Jedi-Bendu. He also played around with names like ‘Ashla’ and ‘Bogan’ for light and dark, which are now the names of two moons around Typhon, home of an early Je'daii Order that studied a more balanced version of the Force. Je’daii that strayed too far to one side or the other were sent to the opposing moon to meditate and restore balance - Ashla for the light and Bogan for the dark. Perhaps the biggest clue is the title for Star Wars 8: The Last Jedi. Fans have gone crazy trying to work out if it’s singular or plural; Luke, Rey, or both? Kylo? Does it mean an end to the Jedi order? Or just the order as we currently know it? If the gray Force hints being built up at the moment come to pass then it could be more of a transitional thing. A new kind of Jedi replacing the old. Remember, Anakin/Vader was the chosen one, supposed to bring balance to the Force. Maybe he will, just not with direct action during his lifetime. The lasting ripples could be enough, driving Luke and Kylo to pursue a new kind of belief. Then, for a final kicker, there’s Snoke, again, an apparently ancient Force user with no clear discipline. Given the long and varied history of different orders and Force-wielders perhaps he’s already the last Jedi by his own beliefs? That’s perhaps a theory for another day. The key thing here is that Disney are doing a lot of prep to make people comfortable with the idea that light and dark isn’t the only way to use the Force and, come Episode 8, we might find out why.